Restaurant Reviews | Nicole, Deipnosophist. After reading Nuvo’s latest “Best of Indianapolis” issue, we decided to try a new place. Of course, we both realized we’d been there before, but it had been years. I ordered Bob, a cheese omelet with calico potatoes and sourdough toast; Carlton ordered the SOB, which was scrambled eggs filled with fresh vegetables, cilantro, and salsa on the side. I also ordered a smoothie of mango, pineapple, and lime. The omelet was fluffy and delicious, but all items on my plate was a little cold when it arrived at the table. The calico potatoes had sweetness and cinnamon that were tasty. The SOB was underwhelming: despite being very colorful, it had little flavor or kick, even with the accompanying salsa. We agreed that the generous four slices of sourdough toast per person were delicious. 3 Sisters is in a very old house, but was very clean. I did not see the restrooms. My water glass had a vague dishwater odor, but the plates and flatware were spotless. Our server was friendly and attentive. She complimented my choice of smoothie and helped me select the right potato side dish. The atmosphere is relaxed, with local artwork on display throughout the brightly painted house-tunred-cafe setting. Sadly, the words in the painting of which I took a picture are illegible. 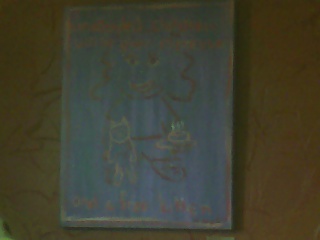 It says “Unattended children will be given espresso and a free kitten.” I laughed out loud. Other quirky paintings liven the atmosphere as well. It’s a bustling, slightly noisy cafe with indoor and outdoor seating. The creaky floors and antique hardware add to the homey atmosphere. The prices were somewhat reasonable, considering the large portions. However, I don’t equate large portions with value. The smoothie was $5, which was a bit pricey but was the most delicious part of my meal, so it was worth it. Ever since the Indianapolis Monthly article naming Elements as Indianapolis’s best restaurant, I’ve wanted to go. It took four years, but I finally did. The menu, which changes frequently, is very short and focuses on fresh flavors and allowing the ingredients to shine. I ordered a lightly dressed whitefish accented with miso and shiitake mushrooms. Carlton had the salmon with steak fries. Both were elegant and understated. The fish was cooked perfectly and the light accompaniments enhanced each bite. The fries were a bit overdone. For dessert, we had the vanilla bean ice cream with warm mission figs and the oatmeal cookies with espresso whipped cream. Dessert was even better than the main course but repeated the same theme: choose only the finest ingredients and simplify the accoutrements. I looked at the wine list and saw several great, mid-range wines and a few newcomers. I was glad to see that they didn’t simply have expensive wine for the sake of its expense. The restaurant is well-maintained. The ladies’ room only held one, which could be an issue on a busier night. It was clean and equipped well. Service by the hostess was very good. She was attentive and gracious. Our server could have been a little more gracious; I had the feeling we were not his favorite customers. We didn’t order appetizers or wine so maybe he knew we wouldn’t be spending a great deal (but I don’t know if my perception is true or not). The atmosphere is great. The original artwork is gorgeous and lush with reds and browns. I liked that several different artists were used; it provided visual variety while keeping the tonal theme. Tables were separate enough for private conversations. We never had to compete with the music’s volume, either. The quiet atmosphere led us to feel more relaxed at the end of the meal. Prices were as expected for this type of fare. I will definitely go back to experience Elements again. I’ve shopped at the Indian grocer next door, but never tried the restaurant. It was 6:30PM on a Saturday night and we were the only ones in the restaurant. I was worried! However, I shouldn’t have been. The food was absolutely delicious. There was a very large, varied menu to suit many types of preferences. A complimentary appetizer of flatbread and three distinctly different sauces whetted our palates (the spicy cilantro sauce was the best). I ordered a chickpea curry and Carlton ordered a chicken curry. Both were so delicious that we wanted to keep eating after we were full. The rice was fragrant and cooked well, except for a few lumps. The restaurant was clean; the restrooms were tolerable but definitely needed an upgrade. The soap dispenser was uncovered and the commode’s hand rails were detached and sitting on the floor. Our server was attentive but not always helpful. He recommended a good beer, but when I asked for a vegetarian dish selection, he simply listed all of the dishes on the menu. He was very good about not rushing us but being available. The decor was very sparse and the music seemed to be a CD player behind the host stand. While the ambience was lacking, the delicious food and reasonable prices are enough cause to visit Ruchi again and again. To see what a real food critic thinks, click here. We ate at Houlihan’s for two days of the Con. On the first night, we had meant to go to Hard Times Café and were confused by the similar, next-door awnings. I was glad for the confusion. Houlihan’s has an innovative menu and more upscale fare. However, despite an extensive menu with all kinds of choices, I had a hard time finding a dish I wanted. I’m limiting carbs, especially white carbs like potatoes and white rice, but almost all dishes were breaded or mixed with rice. I settled on a grilled tilapia and vegetables. The entrée was very good and the service by Yvonne was understated but present.My fellow dinner guests liked the place so much that we went back for a second night. This time, I had a chance to sample some beer on tap. They had a limited selection, but the seasonal wheat put my homebrew to shame. The Guinness was good but not fresh (wow I miss Ireland). I didn’t sample the mixed drinks, but the menu looked promising. I was sitting next to a vegan and wanted to be respectful and order a non-meat dish. Recall that I could only find one item that wasn’t full-o-carbs on the whole menu…I was stuck ordering a grilled asparagus appetizer that was *sigh* breaded and fried. So much for the health-kick diet. My vegan guest could not find anything else he could eat either, though he was not limited by the white carb thing I’m following. So we both ended up with plates of asparagus. The asparagus was delicious. Maybe part of the reason it was so good was that it was the first fried food I’ve had in months! The ends were a little tough, but the horseradish cream was a delightfully unexpected twist.The service was really bad. Our server (Shannon?) was thrown into being triple-seated. Drink orders were missed, the vegan’s dinner came with cheese on top, dinner salads were forgotten. Shannon was extremely apologetic and offered free dessert to the whole table. I would have expected such a gesture, but was still pleased that she did so. Throughout the ordeal, she remained pleasant and did not display her stress to us. She then took it out on herself and reduced our tab by 20 percent! I could tell that this was not her normal level of service. She was so accommodating that I would certainly go back there and request her as a server. My only real complaint is that for such a seemingly full menu, and I’m not a picky eater either, I was hard pressed to find a choice that was right for me. What would possess a seemingly rational girl to spend a long weekend in one hotel room with three gamer geeks? Love of games. Get your mind out of the gutter!!! beat the Evil Day Star out of bed- so we could leave in time to make it to a Firefly LARP on Friday. What's a LARP, you say? Well, congratulations: society considers you normal. For the rest of us, Live-Action Role Playing is the ultimate in nerdliness. Instead of sitting at a table to game, we trot out our poor acting skills- and sometimes our costumes- and play our games in person. I have only been in one other LARP and I hated it. But I love Firefly, I'm up for a challenge, and hey, what else am I gonna do at the Con? I was not sorry. We had so much fun Friday night that agreed to return Saturday. Good thing, because as you can see from this picture on the right *editor's note: photo removed*, my brother was in a Mood after not doing well in the Magic tournament. We headed to the streets of Columbus, Ohio in search of hopped beverages. Being lazy gamers, we chose the place closest to our hotel- Barley's . There we shared a brew and Mike and my brother regaled their wins and losses in Magic. Apparently the folks for whom they metagamed did not show. WoTC had almost zero presence at Origins, so many teams opted to unveil their new decks at GenCon instead. Barley's had very good beers , but poor service for a place only half full. They also had a menu of 20 homebrews, to which our server hastily pointed and said these seven were the only ones on tap. She walked away and we couldn't remember which ones they had! When her shift ended, she was replaced by a guy who forgot they had a brown ale, so they need a better system for knowing what's in stock. The tin ceiling made it awfully loud also. Exhausted, we piled into our hotel room to sleep. Mike valiantly offered to sleep on the floor , leaving Oz the couch and my brother the other half of the king bed. We started the next day Elevensies and a quick shopping tour of the main floor. I've never been to Origins, so I didn't know what it would be like. It seemed like the vendors were very similar to GenCon, but where Origins would have one custom corset vendor, GenCon would have five. I didn't see anything to distinguish the Origins floor from GenCon. Being smaller, Origins should IMHO do something to personalize and/or specialize to attract a certain segment. We made mental shopping lists for Sunday and headed to our D&D game. We bought our way in with generics and I was worried that we would dilute the game too much. However, our GM Daniel kept eleven players engaged in a very interesting module. I have not played D&D for 15 years or so, but Daniel was good at explaining. We had a good mix of personalities in the mix and lots of quick wit. The gnome bard was hilarious- my character miserably failed a movement roll, then did well on silent movement. She instantly began singing a "Silent and Flailing" ode- to the tune of Pink's "God is a DJ!" It was a great mix of fun, polite players fighting battles and solving puzzles. We had dinner at some random bar. I would love to review it for you, but it left no impression on me so I can't remember the name or what I had to eat!! We spent the meal talking about games and preparing for Part II of our Firefly LARP. The great thing about the LARP style is that the FF format means we formed a ship crew and worked together. The GM, Karen, had a pretty good gaming system and I was really impressed by her ability to smile so much through the frenetic pace of the scenarios piling up. Our crew were so innovative in gathering information that we ended up doing very well. We fed the info to our captain- Oz- and he made great decisions. My brother wins the acting award, not only for how he played his character's stats, but his Firefly 'verse speech patterns and clever comebacks. We knew we were on track when GM Karen radioed for some ship stats and said to her crew- "you know, the Thing with the People- in the DESERT…the MEGAPLOT!" We did very well and our crew was not injured. After a major revelation, she asked what we would do next. Oz said, "we'll see you at GenCON!" and we "flew" into the black. The developers are planning to have a MUSH for us between now and GenCon. I can't believe I'm about to say this: I enjoyed the LARP so much I'll do it again! We decided to celebrate our clever gaming with martinis at MoJoe's, a bar my brother had found. The drinks were delicious and the outdoor seating was great for people-watching. Indoors was a modern-ish bar with the requisite Techno Mood music that every martini bar must have. I would recommend it, but the restroom was the dirtiest one I've seen in a long time (please recall that I've been on a nine hour plane ride recently). Paper towels overflowing, half empty soda bottle on the floor, trash… very unpleasant. The kind that makes one wonder is staying to wash one's hands will make them cleaner or dirtier. So back to a fun topic- our conversation. The four of us had a drink or two and enjoyed the evening. The conversation was fantastic. All four of us are vastly different people with different backgrounds so the conversation was heated on occasion. But deipnosophy is my passion, so the wide variety of topics was incredibly enjoyable. We all had something different and interesting to contribute. There was some live-action fighting from Edhellen Armoury , The same people who were doing it last year at GenCon. Sadly, this year, the pros were not fighting, it was gamer y gamer, and the fights were not as good. I don't know why they opted out. Liability? Strain? I remember the guy who does the most fighting (King Arthur dude) was dripping with sweat last year, and some of the gamers did some bad illegal hits. Anyway, it's fun to watch the combat. I would be remiss to pretend that the only interesting thing Edhellen is the fine boffer swords and larp props. One of the young men who works there has the bluest eyes I've ever seen. I get Barbara Mandrell-style togue-tiedand embarrassed around him and won't look at him. Oz uses this for his amusement and points the guy out to me. Here is the e-vile picture Oz took of the two Armory guys in costume. The guy on the left is the one who belongs in a King Arthur movie; Blue Eyes is on the right. Enough said. Oz and I both bought a few things we'd scoped on Saturday, but found ourselves saying "I'll find that on the internet" or "it's cheaper at GenCon" or "I'll wait until GenCon." In fact, I've mentioned GenCon in every paragraph of this post. Here's how I see Origins: First, it's only 38 days apart from GenCon. Second, it's smaller. Third, it offered nothing to me I can't have at GenCon (and more of it too). The small size made it no more personal and no more unique. I love games, but I can't afford the time nor the money to invest in two Cons so similar. I was appreciative of what Origins was, but there was not enough to keep me going there every year. See Oz's blog entry for his take on all of this. I arrived home tired, happy, and happy to see Carlton. I am so very lucky to have a spouse who lets me do all of this with my brother and our other nerdy friends. The amazing part to me is that it's not something he understands. All he knows is how happy it makes me, and he listens patiently to my stories of winning a saving roll like I'm regaling my latest gold game to a non-golfer. Why am I awake at two in the morning? Because I am too stoked about playing FF at GenCon! See you there!!!!!!! Another hotel restaurant. I was forced by nostalgia to go to this place. I had been nine years earlier and I thought it was the kind of place my dad would like. Dad and I both chose the fresh fish. I asked what was freshest and the server was quite knowledgeable. I chose monchong, firecracker style, and Dad chose monchong, Duke’s style. The fish was superb in flesh and flavor in both styles. The side of rice had lots of broken grains and was obviously scooped from a big, congealed batch, but did have good flavor. Both styles worked well with this kind of fish, and the firecracker heat was very low, allowing the fish flavor to shine along with the fresh guacamole relish topping. For the wine, I picked Santa Margherita Pinot Grigio from Italy. I normally only use Pinot Grigio in making white sangria because its flavor is often too mild to stand against a food pairing. However, my dad is intolerant of lots of stronger wines, so I thought I would try this wine a friend had recommended. It was crisp, refreshing, and tasted like fresh apples and light spice. It was overwhelmed by the firecracker fish, but paired well with the milder fish prep Dad had. It would be refreshing to drink on the patio on a hot summer day, but too boring to stand alone for long. Duke’s is fun but tourist-y. Dad liked it and so did I.